Working at ITC isn’t just a job, it’s a way of life. Join us and experience a better life. Our company is only as successful as the people we employ. They are our greatest asset. Whether you are just beginning to think about your next job or have already decided to make a meaningful move, we want to talk to you. ITC is built on the values of people like you. Men and women who believe anything is possible as long as we live right, work hard and pull together as a team. EXPLORE A WORLD OF OPPORTUNITIES TODAY! There are nearly 500,000 unemployed veterans in America and almost 50,000 who are homeless. These men and women fought for us; now it’s our turn to stand up for them. 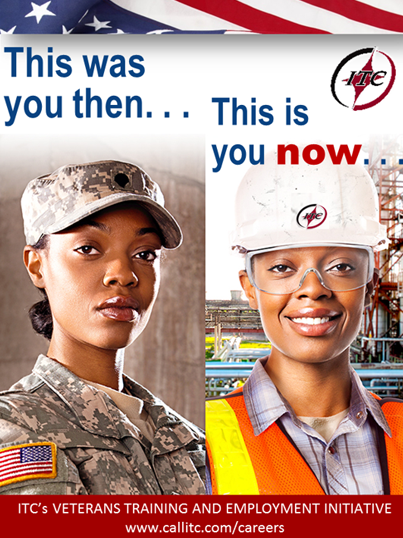 ITC proudly supports U.S. soldiers, veterans, and their spouses. We are actively seeking employees who have served in the U.S. military or reserves. You have skills that can be applied to create a great career with ITC, in both professional and technical positions. ITC is committed to its employees and we demonstrate that through our comprehensive offering of benefits. We know that when we take care of you, you take care of business. 23 queries in 1.235 seconds.